In order to treat Perioral Dermatitis it is first important to know what it is. So what exactly is it? According to patient.co.uk "Perioral dermatitis is a rash that develops around the mouth. The word perioral means "around the mouth". Dermatitis means "inflammation of the skin". "Typically, small red or pink lumpy spots develop on the skin anywhere around the outside of the mouth. That is, they may appear on the chin, cheeks, and the skin next to and below the nose. They look a little like acne spots, but perioral dermatitis is NOT acne. The skin under and next to each spot is often red or pink. It there are a lot of spots next to each other, then the area of affected skin can just look red and lumpy. Sometimes the skin surface can become dry and flaky. Typically, the skin just next to the lips is not affected, or is affected much less than the skin just a little further away from the lips. So, in some cases, it looks like the rash forms almost a ring around the mouth, but sparing a small border of skin next to the lips. Occasionally, the skin around the eyes is also affected. The severity of the rash can vary from a few minor spots that are barely noticeable, to a definite and obvious lumpy rash that is around the mouth. The rash is not usually painful or itchy. However, some people report a mild burning or itchy feeling. Others report that the affected skin feels tense. The rash is not serious and is not associated with any underlying disease. However, it can be unsightly." So again, really great information, but how to treat Perioral Dermatitis was a frustrating journey. I couldn't find the answer. There really is hardly any good information on exactly how to cure or treat PD. Why? This rash I take it, is just as a mystery to doctors as it is to us in my opinion. As I mentioned in my earlier post what the doctors were doing didn't help and I didn't want to take steroid cremes or antibiotics. Those are temporary as well as toxic fixes, the rash will ultimately come back anyways. So I didn't even want to go there. Many times I felt like I wasn't making any progress with my PD. My skincare routine was painfully long and difficult. I experimented with different skin care regimens over a period of time. I became my own science project! To save you the pain and length of reading each method I tried, I want to share with you today the 3 topical serums/ointments that I use frequently to soothe and ultimately got rid of my PD. This does not include lifestyle, cleansers etc. Those are yet other posts to come. 1. Dr. Alkaitis Organic Soothing Gel: Again, if I were stranded on a desert island the Soothing Gel would absolutely go with me! I cannot live without this amazing concoction of herbal healing bliss. The gel is actually more like a liquid than a gooey gel. The plant based ingredients within Dr Alkaitis Soothing Gel are incredibly antibacterial, antiviral and so amazing for even the most sensitive skin. I call it a superhero product and works naturally with skin. With each use, I noticed redness dissipating, the bumps flattening more and more and even the pigmentation I got as a result from the PD has started to fade. The answer to my prayers! The gel also works nicely as a light moisturizer. 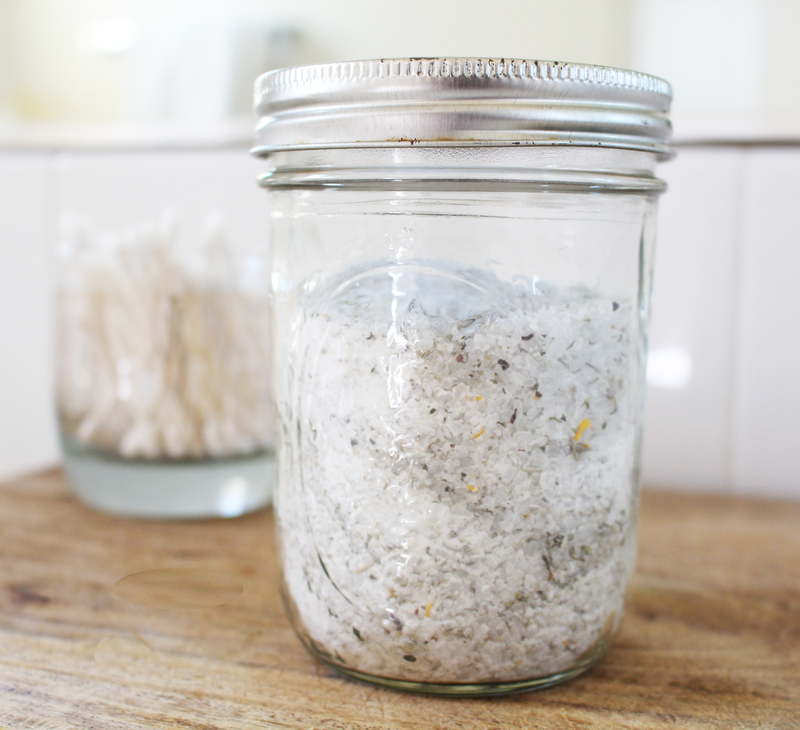 After I double cleanse and pat dry my skin, I spread a thin layer all over my face. I allow the gel to thoroughly soak into my pores before putting anything else on top. As a side note, even if you don't have perioral dermatitis, this soothing gel is universal. As an Esthetician and consumer of this product I would recommend it to everyone. I don't make that statement about many products, so I hope you will take that message whole heartedly. 2. True Nature Botanicals Pacific Face Oil: Earlier this year I wrote a review on this face oil here. 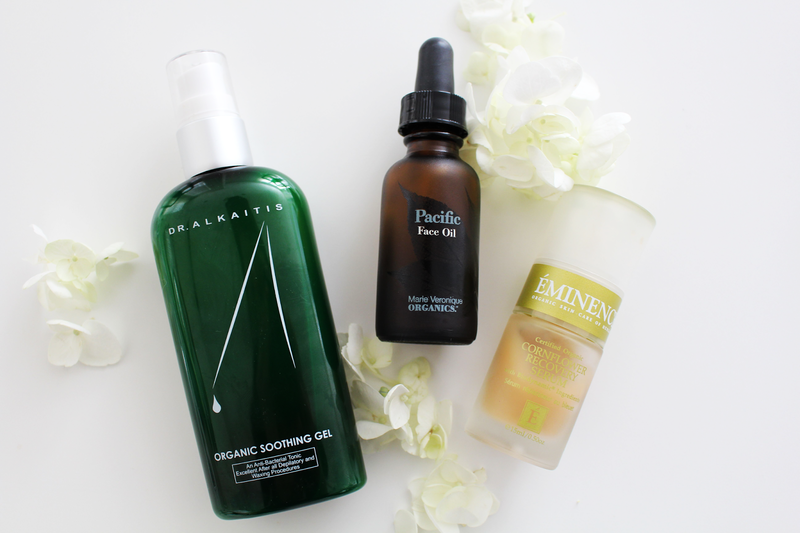 However, I feel the Pacific Face Oil deserves another review in perhaps another post to thoroughly explain why this product is so incredible. I contacted True Nature Botanicals, asking them in-depth questions about this oil in relation to perioral dermatitis. Let me tell you the customer service with this company is phenomenal! They are so knowledgeable about each ingredient they put into their products! I was hesitant to use oil again on my face after finally seeming to get the PD under control. I had read that oil can irritate PD. So I contacted Kevin Dooley at TNB, and he went over in great detail many of the ingredients are antibacterial, antiviral, anti inflammatory and so much more. I learned so much from him! So I decided to trust his knowledge and have been using the Pacific Face Oil as my daily moisturizer ever since. I love that a little goes a very long way. It does not irritate my PD, in fact I know it is giving my skin exactly what it needs to stay healthy, vibrant, moisturized and clear from perioral dermatitis naturally. Thank you True Nature Botanicals for all your support and such a great product! 3. Eminence Cornflower Recovery Serum: This hydrating serum is part of Eminence Organic's Biodynamic product line. This means that this product is incredibly potent, healing and free of all chemicals, pesticides and other toxins. The plants are even planted and harvested according to lunar cycles. Pretty neat info! As the title of the serum says it is for recovery. A perfect serum for those with redness in their skin caused by rosacea and other skin irritations. This serum helped get my perioral dermatitis to cut back significantly. It detoxed my skin of the rash naturally using cornflower, chamomile and hibiscus. It helped put the moisture back into my skin where the rash was occurring and also soothed the skin surrounding it. I love this serum, however I am not needing to use this serum as often as I did in the beginning. Sometimes I throw this serum on for extra hydration and anti aging purposes. It is my hope that anyone out there suffering with perioral dermatitis can see positive results using these 3 products. They worked for my skin and it is not a guarantee it shall work for others. 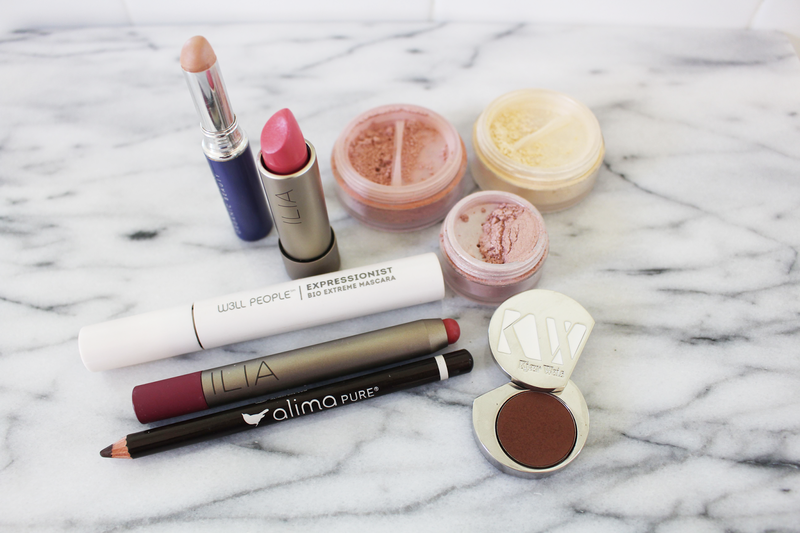 Have you tried any of these products for perioral dermatitis or another skin issue? I'd love to know! Again, I will continue the perioral dermatitis saga with more helpful tips on treating it and so much more. Stay tuned! Today is a very personal and transparent post about my own skincare problems or shall I say challenge. Almost 1 year ago now, I was unwillingly initiated and a participant in the peri oral dermatitis club. Let’s just say its not a fun club to be in at all. Following up on this post where I introduced my struggle with peri oral dermatitis; it all started for me about a month after I stopped breastfeeding my son. Prior to that, I never had even heard of PD. In fact when it all started I thought I was getting little acne breakouts. It started on the right side of my face, between my nose and mouth. 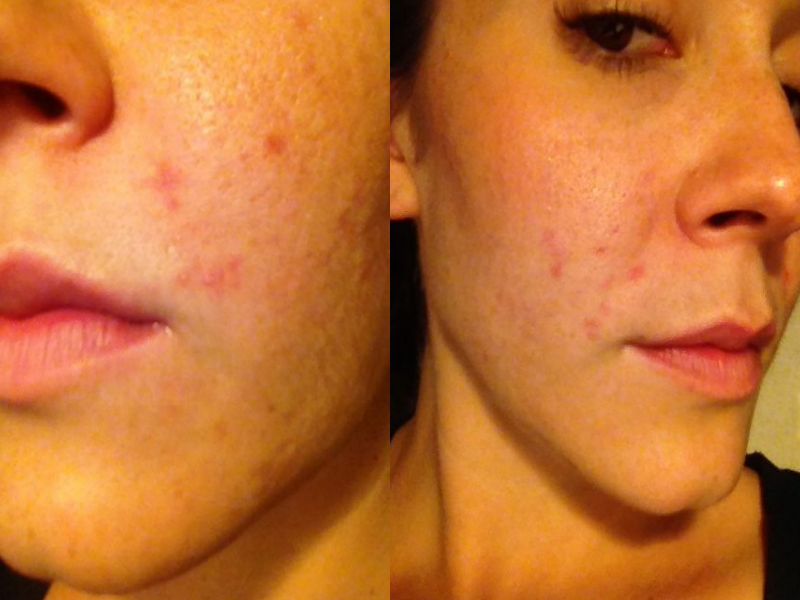 So I started treating it as if it were acne. No improvement. It actually started getting worse and worse. The itchiness was so bad. Then I started to think I was getting a fungal infection? I know, weird right. Then suddenly the same strange mystery breakout was now also on the left side of my face between my nose and mouth. That was it. I’d had it. My self esteem was plummeting, makeup couldn’t hide it and it was only getting worse. Imagine my embarrassment as an Esthetician, going into my dermatologists office. He took a quick look at me and immediately deemed “Oh, its peri oral dermatitis” I was stunned. Peri- what??? I had never heard of this skin condition in my life. I was never taught it in school even though it is actually a fairly common issue that many women suffer with. The derm said, “Well you had a baby, hormones change and fluctuate so much during this time of your life, your skin is producing more oil in those areas” He proceeded to talk to me about my skincare regimen, told me to use this certain type of gel cleanser that you can find at any local drugstore and put me immediately on a topical non steroidal creme. Honest moment here, I was desperate to get rid of the PD so I tried those two recommended products. Mistake. I SO knew better. My condition did not get better at all, it actually got angrier and angrier. The redness was horrible, the burn, the itch and the unsightly tiny bumps wouldn’t go away at all. I knew the next step would be to add a topical steroidal creme to the PD and I didn’t want to go there at all. This is me about a year ago. Sorry the picture quality is not the best. I shot these images using my iphone in the evening. I am showing this to be very transparent as well as brave to show how my skin looked with peri oral dermatitis. As you can see the PD is very inflamed and is causing the rest of my skin to be irritated as well from the result of the PD. I decided as frustrated as I was, I know knew what this irritation on my face was and decided to do my own research about it. I quickly learned that there is a whole cult of PD sufferers out there. People are putting all kinds of weird stuff on their PD claiming it works but then conditions come back. I found in Europe there are all natural products to aid in the relief of PD but those of us in America can’t get those... Not surprising! I also discovered that my shampoo and soaps and even toothpaste were either causing PD or exasperated it! Then as fate would have it I met in person at A Night For Green Beauty two lovely ladies whom both had perioral dermatitis themselves: Dr. Sarah Villafranco of Osmia Organics & May Lindstrom of May Lindstrom Skin. Both of them soothed my concerns, and told me a bit of their stories and recommendations. I looked at them and all their natural beauty and knew that if they survived PD, so could I! Here’s a bit of what transpired: Toothpaste both claimed is a major culprit as well as my shampoo. I remember May said “ Don’t be surprised if you switch those products that your PD will just go away” Ah, that gave me HOPE. She also had a product recommendation for me to soothe my inflamed condition: The Blue Cocoon. You bet I bought it that very night. There’s more to come on The Blue Cocoon, for now you can read about the 3 highlighted ingredients over at Eco Diva Beauty. Dr Sarah gave me a sample size of her amazing Black Clay Facial Soap. I can’t live without the Black Clay Facial Soap. If I were on a desert island that would be one of several products I would have with me! 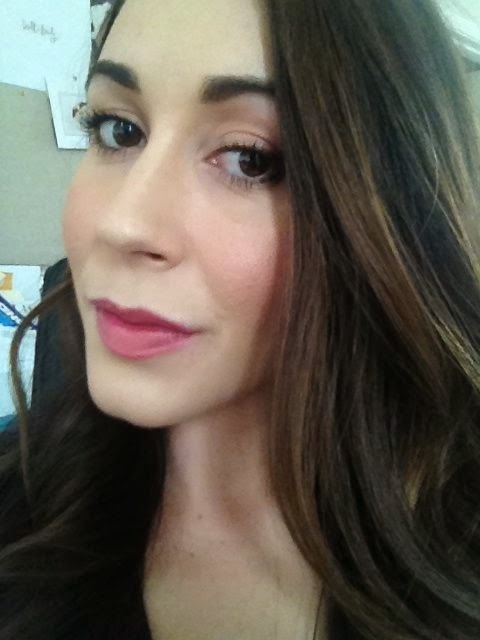 Dr. Sarah also has a great blog post and video at her site with valuable information about peri oral dermatitis. These are some very recent selfies that I took with my iphone and as you can see my skin is free and clear from peri oral dermatitis. I am so blessed and thankful to say that I no longer live with scaly, itchy, red and bumpy skin. I have been able to find the solution to my Peri Oral Dermatitis. The skin between my nose and mouth does have a slight pink undertone to it but its not bad at all. At least my skin is clear and not irritated any longer. So there you have my PD story in a nutshell. To continue my series of Peri Oral Dermatitis, tomorrow I will be sharing the serums/ topical products that I can’t live without. Each post from here on forward will explain in detail how I no longer have to suffer with PD and the easy skincare regimen that keeps it in check. I am really excited about today's post where I am sharing a bit more of a personal article today about my confessions about being an eco diva and my evolution into going green with my makeup, which lead into skincare and more. Click on over to see what its all about at Eco Diva Beauty. 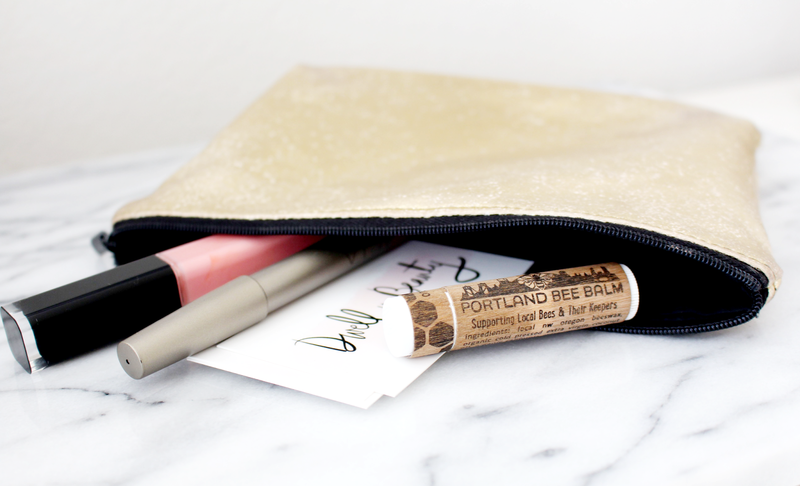 Portland Bee Balm + A Giveaway! 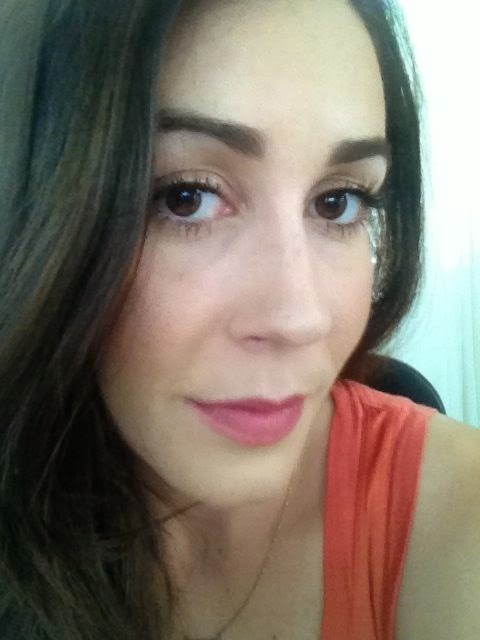 Trying all natural products is one of the fun things about being an Holistic Esthetician-Blogger. I especially get excited to try amazing all natural products that have incredible stories behind the product and brand. I really want to shout out to Portland Bee Balm for being such an inspiring company! I was contacted by them inquiring if I'd be interested in sampling their lip balm. Heck yes! What I didn't realize until getting to know the product and more about PBB is that they really are a company with a heart and soul. Integrity, honesty and a passion for what they love to do is evident in their incredible lip balm and when you read their story and connect with them you can just feel it. Those are the kind of companies that are rare to find and I love to work with and know. For PBB it started as a love for bee-keeping. Many people don't realize that bees are considered at risk and an endangered species. This is not good for us or the planet at all since bees do so much hard work pollinating a majority of all the plants we eat. Bees are the reason for healthy plants, which in turn means healthier air, water, soil.. a healthy planet. Portland Bee Balm has some great tips on their website about what we can do to make a difference with bees. I sure don't want bees to go away anytime soon so I support the mission of PBB wholeheartedly. 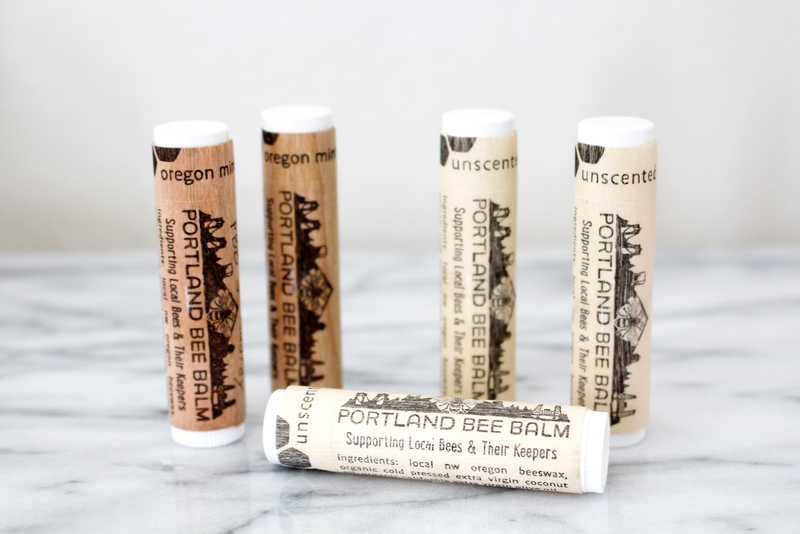 Portland Bee Balm is made of 4 all natural ingredients: Local Northwest Oregon Beeswax, Organic Cold Pressed Extra Virgin Olive Oil and Oregon Peppermint Essential Oil. I love the fact that the lip balm comes standard in a tube. Easy to use and keep in my makeup bag, which I take everywhere with me. It hydrates and moisturizes my lips in one all the while protecting them from the elements. My lips are left smooth and refreshed from the peppermint essential oil. Even my husband hopped on board and is now a huge fan of PBB as well. He tends to suffer from dry, chapped lips, but this balm has helped heal and soothe them. On a design note, the tubes are each wrapped in real wood shavings which eliminate the use of paper which is not eco-friendly at all. 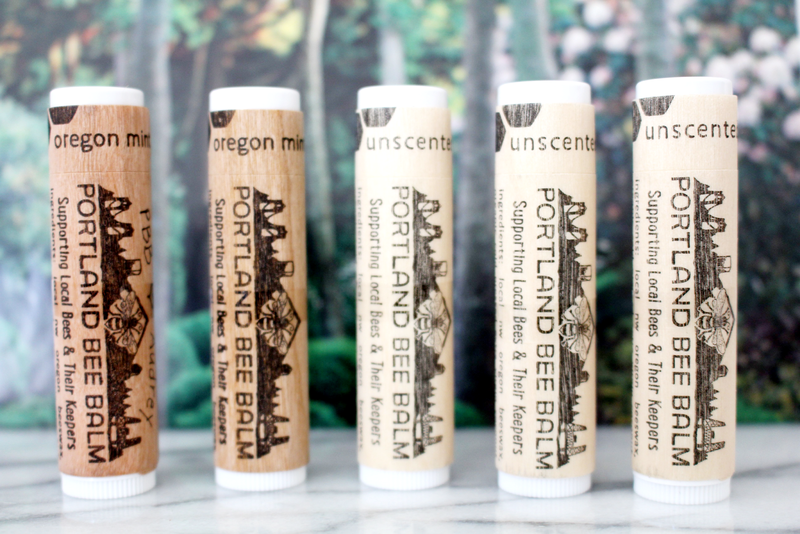 Everything about Portland Bee Balm from the design to the balm is sustainable and earth loving. Now, I am foreseeing stocking stuffers this year! If you tweet or facebook this giveaway you can enter again (be sure to leave a second comment for this). This giveaway ends this Sunday, November 9th. Good luck, Everyone! In a mixing bowl, mix all the dry ingredients together: almond flour, coconut flour, coconut sugar and baking powder. Then toss in the spices, cinnamon, ginger, cloves and sea salt. Turn the mixer on low and mix thoroughly. Next, add the eggs, milk, vanilla then the pumpkin. Mix until all ingredients are blended together well. Spoon the mixture into paper cups placed inside a cupcake pan. 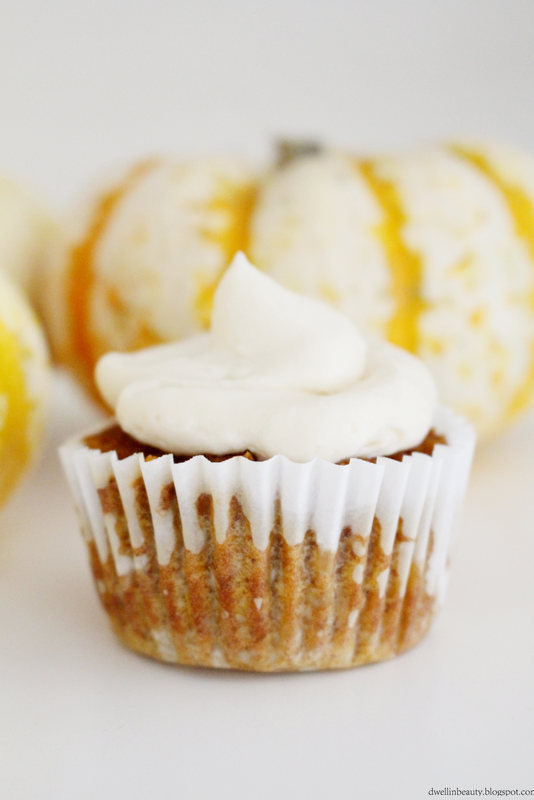 Bake cupcakes for 25 minutes or until a toothpick inserted comes out clean. 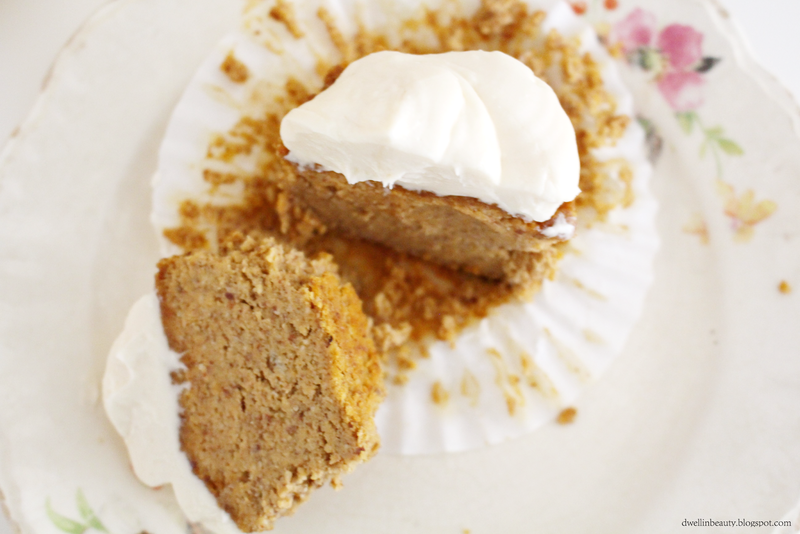 While the cupcakes are baking this is the perfect time to whip up the frosting. Use a blender for this process. Toss in the cream cheese, butter and whipped honey. Mix until smooth and creamy. 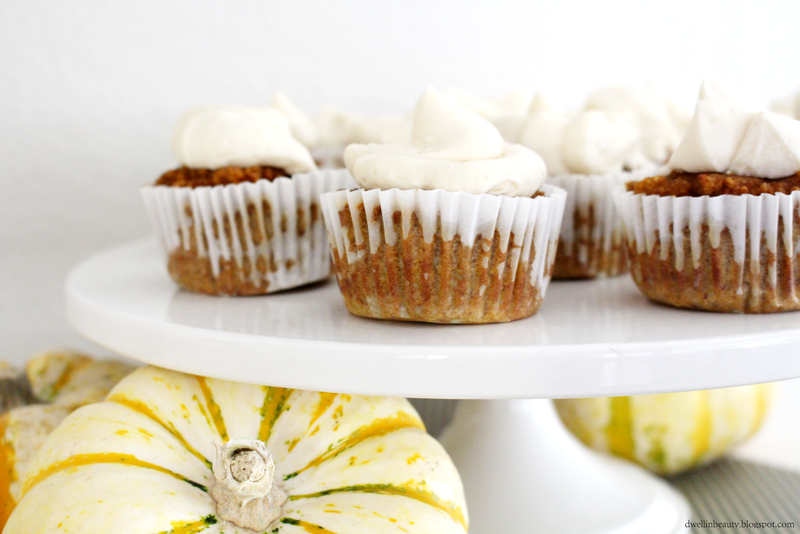 Set aside and frost on cupcakes once they have cooled. 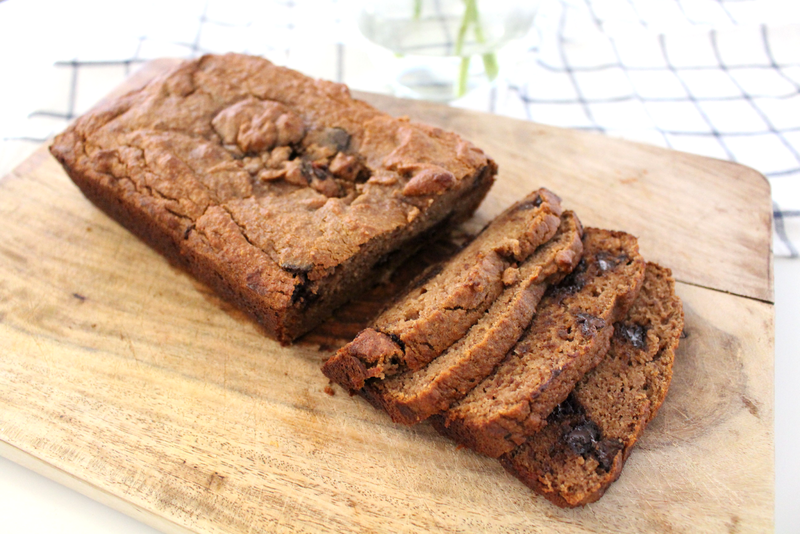 In case you missed this article, head over to Eco Diva Beauty to get this amazing recipe for gluten free chocolate chip banana bread! Its grain free and paleo diet suitable! It is mouth drooling delicious! Click here to read the article.